“Wasted” our new single is out NOW! Listen everywhere! Since the release and tour of their debut EP, Different Shades of Black, Attic Light has become known for their vigorous and eccentric live performances which have made the band a distinct presence in the Midwest. The Kansas City based band recorded their most recent album, The EXILE EP (featuring the single “Whiskey Love”), in Nashville with producer Dohse of AGD Entertainment. After the release of The Exile EP, the band spent months touring the Midwest, performing and appearing at many prominent venues, regional radio stations, television programs, and publications. Following the The EXILE EP, the band released the hometown inspired dance single “Hot in Kansas City”. 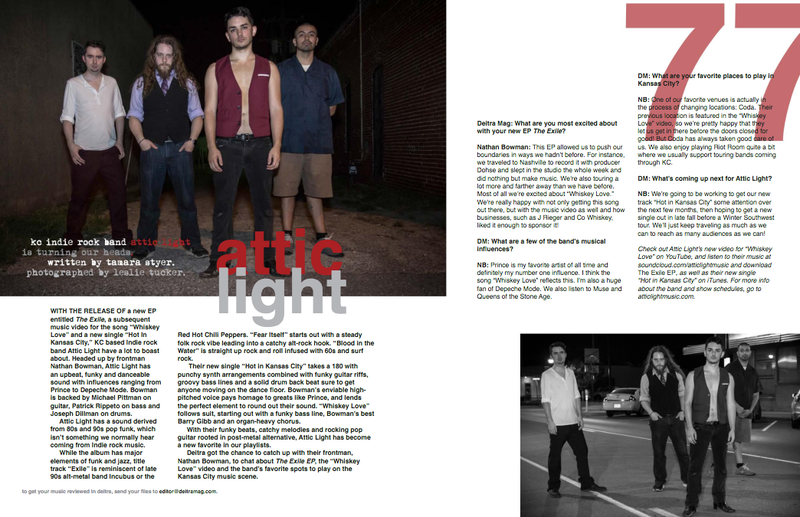 Attic Light is currently working on their third EP, beginning with the release of the single “Wasted”, a song of longing which continues the band’s journey in fusing dance and rock to create an infectious visceral energy. Attic Light is Nate Bowman (vocals, guitar, keyboard, synthesizer), Michael Pittman (guitar), Patrick Rippeto (bass), and Joseph Dillman (drums).